Eva Peron was a former prostitute turned mistress, who became the First Lady of Argentina from 1946 until her death from cancer in 1952. During the Peron's reign, they bankrupted the country for their personal pleasures, opened the country as a safe haven for high ranking Nazi officers and used nefarious methods to deal with those who opposed them. And they helped the massive number of poor citizens by building homes, schools and other charitable organizations - from which they skimmed a great deal and deposited in a Swiss bank account. There's no crying in Argentina! Andrew Lloyd Webber and Tim Rice thought it the perfect plot for a stage musical, and Evita opened in 1979 on Broadway. An immediate success, it caught the attention of Hollywood and executives at NBC decided that non-singing mini-series would bring in the viewers. 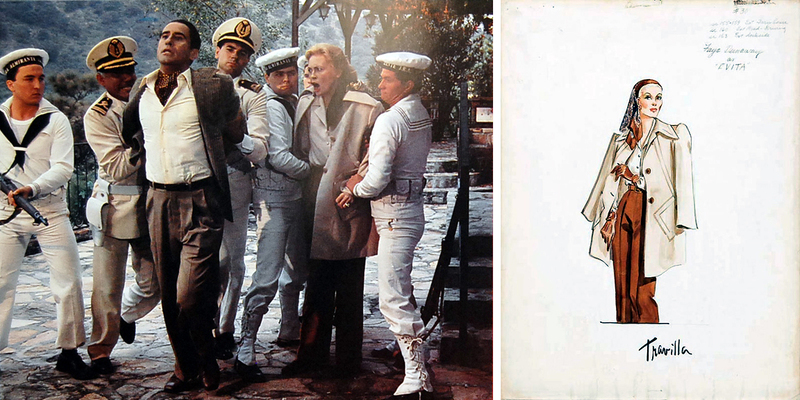 After commissioning a script, they offered the lead to Faye Dunaway (Bonnie & Clyde, Chinatown, Network) who told Knight Ridder's David Bianculli "A TV movie based on the life of Eva Peron - how could I resist that? I couldn't NOT play her." Rita Moreno and Jose Ferrer co-starred with James Farentino cast as Juan Peron. 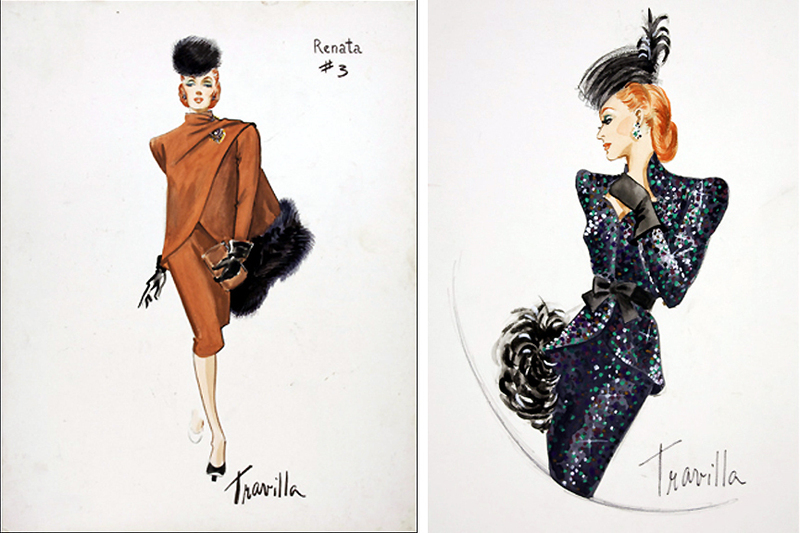 Two sketches for Rita Moreno's character. 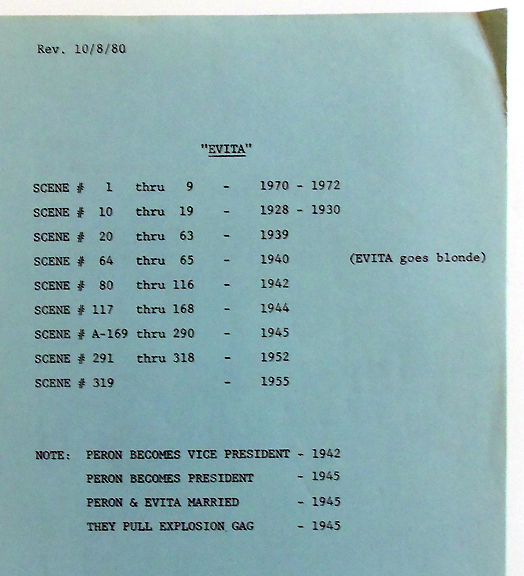 Script breakdown of scenes by years. Then there were the thirty-six changes for Mr. Farentino, several for Miss Moreno and various other cast members and extras - it took two sewing departments, five tailors, five seamstresses, and seven wardrobe assistants to achieve the 1940s "look" needed. Various streetwalker ideas. Notice the repeated use of green. Travilla remembers their first meeting at Dunaway's penthouse apartment overlooking Central Park. "I arrived for my interview and upon exiting the private elevator in the foyer, the first thing I saw were the three remaining walls covered in framed sketches from Faye's favorite designers. At that point I thought "Oh Hell, I'm dead." . But I was determined to at least show her my drawings. I wanted to work on the series because it was a wonderful showcase for clothes." Several in various shades of browns. Dunaway "wore wonderful white lounging pajamas with thongs." he recalls. "her hair was flying' she was relaxed, casual, charming." The meeting lasted for three hours, Faye was delighted with the sketches and Travilla got the job. He looked forward to their next meeting when production began in Mexico. 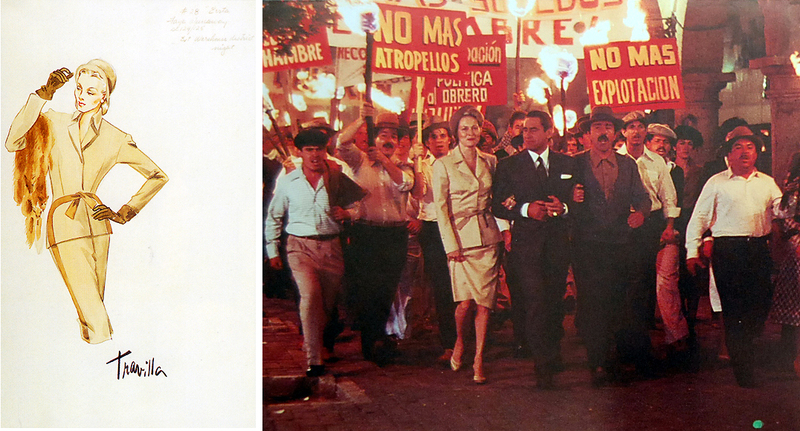 But when she arrived on the set, the spell of Evita was upon her. She was stronger, cooler, more controlled. Nightgown minus sheer robe on display in Palm Springs 2009. 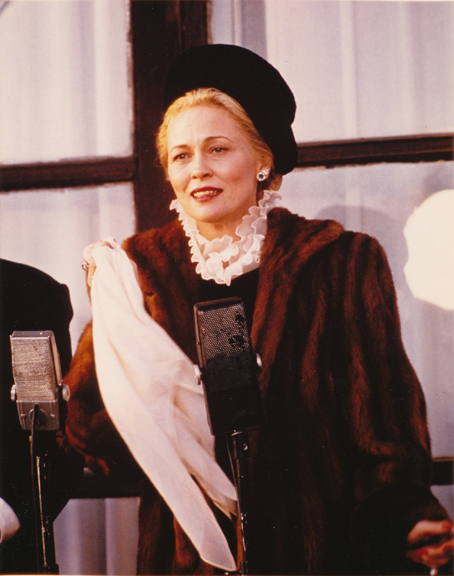 Dunaway informed the press during publicity, "In the movies, as often is the case in Hollywood, the production companies don't give themselves enough time or their projects enough care because they've got budgets and schedules to meet. When you're not investigating thoroughly enough, it gives you bad habits; you tend to rely on formula.....In 'Evita Peron,' we made the time." Travilla however, remembers his experience a little bit differently. "I've never worked so hard in my life. I had the dressmakers working just ten minutes ahead of a scene." Alternative version on left to film final on right. 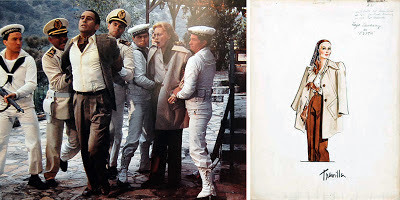 Dunaway's reputation as a "difficult" actress became evident when she refused to wear one of the designs she'd loved weeks before, a gray gabardine suit, feeling it was too modern, it didn't fit the period. "But I knew it did because what I'd done, it was cheating in a sense, was to make exactly the same suit as I had for a film in 1949!" The actress still refused the design until Travilla sent over a wardrobe photograph of the outfit from the thirty year old film. Dunaway apologized, but there were other hurdles to be jumped as filming progressed. Possibly one the suit mentioned above in this trio. "Dunaway as a perfectionist. Someone who asks you to fir and re-fit a dress over and over and over again. Someone who'll ask to alter something 1/32nd of an inch. Or drive the milliner mad with the placement of dimple in a beret." 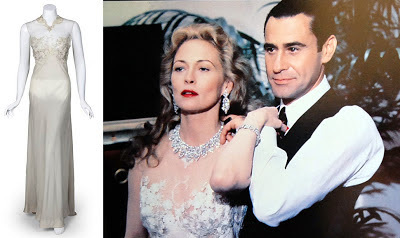 Travilla nearly walked of the production when Dunaway's anger exploded after the designer adjusted the drape of a fox stole across the actress' shoulders. 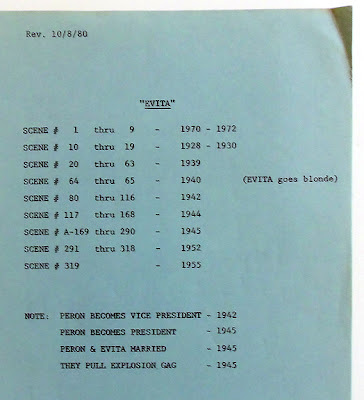 The director, Marvin Chomsky (Roots) eventually calmed him down by explaining that the entire crew was in the same position as he - they were no longer directing an actress, but First Lady Peron herself, telling Travilla "She becomes more like that woman every day. But Bill, she's magnificent." Privately, Travilla said Faye as "A very tough lady, and each day she got tougher." But publicly he was more gracious: "Perhaps she was difficult, but worthwhile. It's because she was really into her role. Faye not only wears my costumes beautifully, she becomes the character and is glorious in those clothes." 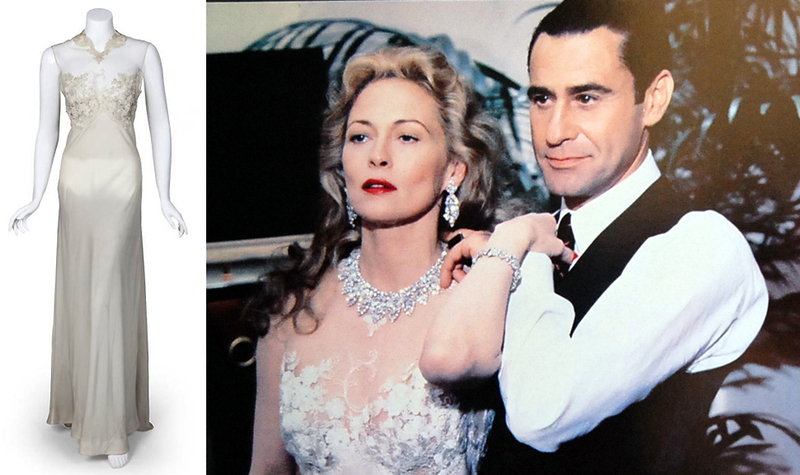 He added, "She reminds me of Joan Crawford, whom I designed for in 'Flamingo Road' in 1949." A rather ironic statement as Dunaway's next role was as Crawford in the (now) camp classic Mommie Dearest. 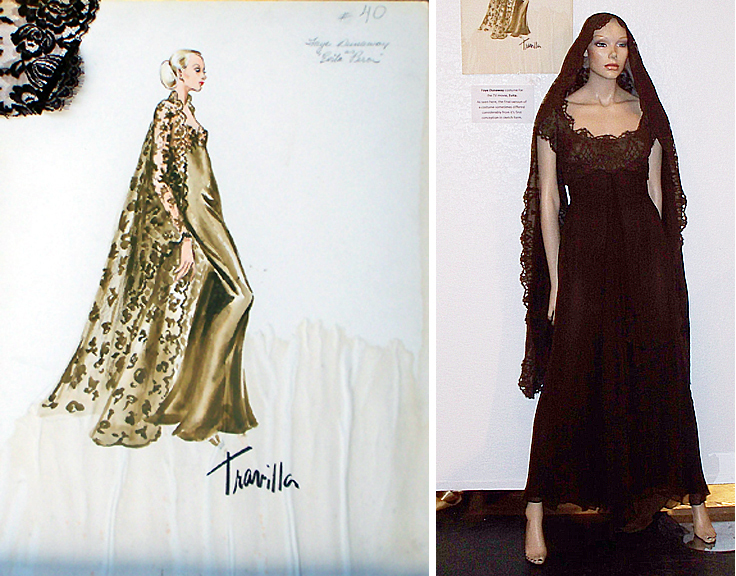 Travilla was nominated for the 1981 Emmy for Outstanding Costume Design for a Special, losing to a PBS Ballet of Shakespeare's "The Tempest." Zephyr Productions company that financed the $8 million film was owned by the late actor Gary Coleman, child star of Different Strokes.